Most interesting Windows Phone apps rely on some network service for their functionality. So at some point in your app you may need to know programmatically if there is network connection available or not. For example, the Translator by Moth app relies on the Bing Translation service for translations. When a request for translation (text or voice) is made, the network call may fail. The failure reason is not evident from any of the return results, so I check the connection to see if it is present. Dependent on that, a different message is shown to the user. Before the translation phase is even reached, at the app start up time the Bing service is queried for its list of languages; in that case I don't want to show the user a message and instead want to be notified when the network is available in order to send the query out again. As usual, there may be better ways to achieve this, but this class works perfectly for my scenarios. You can download the code here: MyNetworks.cs. 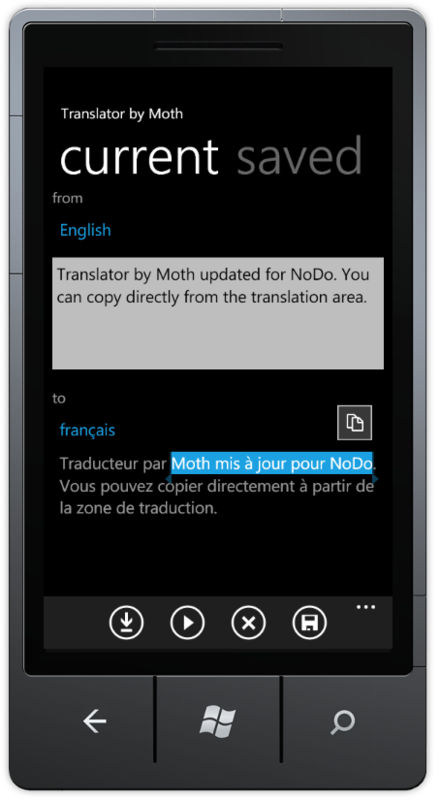 Some Windows Phone 7 owners already have the NoDo update, and others are getting it soon. This update brings, among other things, copy & paste support for text boxes. The user taps on a piece of text (and can drag in either direction to select more/less words), a popup icon appears that when tapped copies the text to the clipboard, and then at any app that shows the soft input panel there is an icon option to paste the copied text into the associated textbox. For more read this 'how to'. Note that there is no programmatic access to the clipboard, only the end user experience I just summarized, so there is nothing you need to do for your app's textboxes to support copy & paste: it just works. The only issue may be if in your app you use static TextBlock controls, for which the copy support will not appear, of course. That was the case with my Translator by Moth app where the translated text appears in a TextBlock. So, I wanted the user to be able to copy directly from the translated text (without offering an editable TextBox for an area where user input does not make sense). Take a look at a screenshot of my app before I made any changes to it. I then made changes to it preserving the look and feel, yet with additional copy support (see screenshot on the right)! So how did I achieve that? Simply by using my co-author's template (thanks Peter! ): Copyable TextBlock for Windows Phone.